A Cartel clock with a movement of three weeks duration. The movement signed Charles Balthasar (master clockmaker from 1717 onwards). The dial with outer Arabic and inner Roman numerals and a pair of pierced gilt brass hands. The movement with verge escapement; striking on the hours and half hours. The “style rocaille” clock case is decorated with flower sprays and leafy scrolls all over, ending at the top in an exuberant acanthus scroll. The case below the dial shows an asymmetrically shaped pendulum aperture, defined by foliate scrolls. The case is terminated by a bow tying the different flower sprays, the bow is decorated by a single rose. 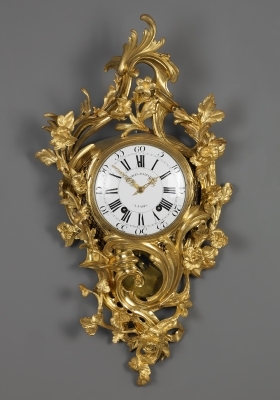 The clock case is a beautiful example of the “style rocaille” (quite different from the somewhat exaggerated rococo style). Natural looking, long and sinuous lines of foliage and flower motifs characterize the style rocaille. Although details are very often a-symmetrical, a style rocaille object is pleasing to the eye, because its overall construction is a symmetrical one. Signed on the dial and on the movement: Charles Balthazar à Paris.